Thank you everyone for your lovely response to my last post about the idea of blanket alonging together. We've been chatting away over on the Ravelry thread about it and I think it's really starting to take shape now. It's all going to be quite informal and open, so anyone making any blanket can join in really. But there will be a prize thread on Ravelry! 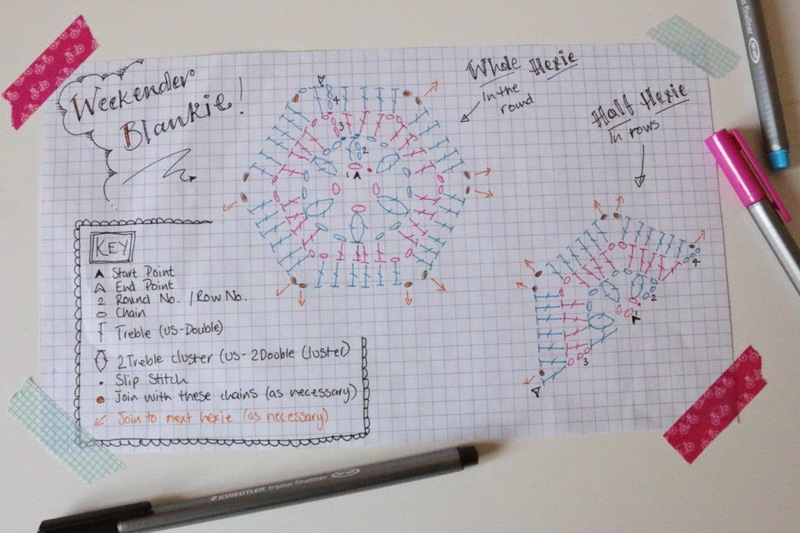 I think I'll probably be back to get the ball rolling on the actual 'Alonging' bit on Friday, but in the meantime, I thought I'd share the patterns for my Weekender Blanket Hexagons with you. You don't need to be making this particular blanket to join in the 'along' with us, but this is just information ahead of time for those that do want to start their own. I hope you can make head or tail of them ok. I thought it might be easier to draw them out rather than work on them on the computer, as I don't have any special software for the job, but to be honest, I'm not sure it is much easier for me. 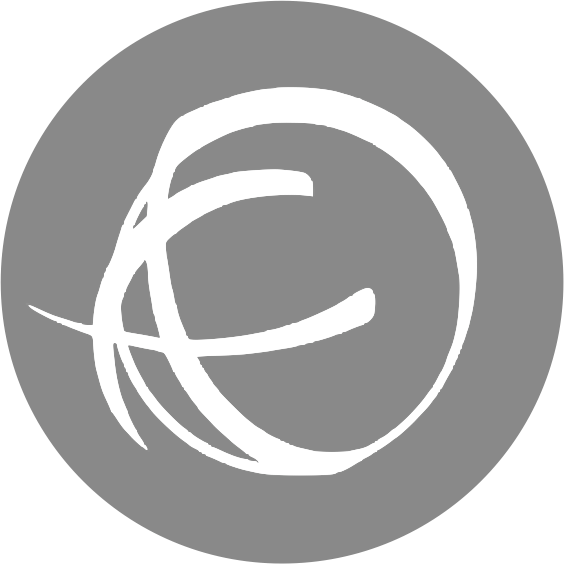 Anyway, you can click on the picture to get a bigger version so that you can see everything a little more clearly. I've included a little half hexie too, so that you can fit it into the sides, like I have in the photo above, if you want your sides to be straight. I've also written up the pattern for them as well, for those that prefer working that way. 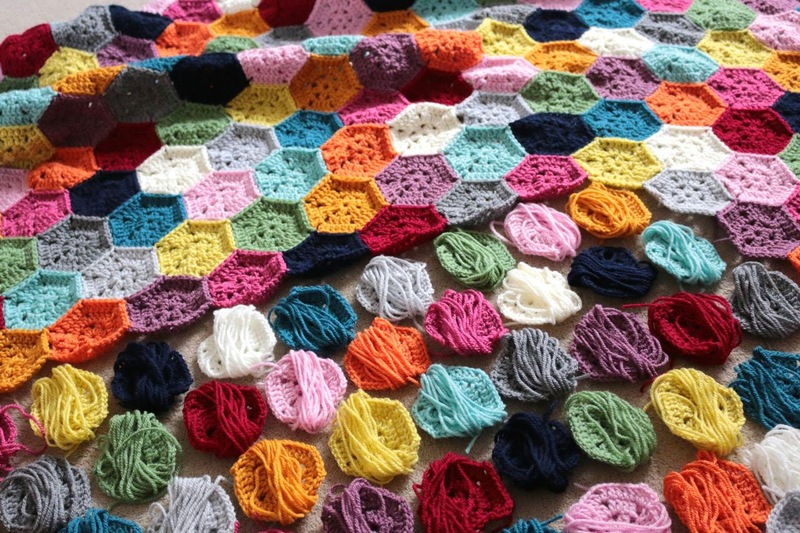 It's not a full blanket pattern as yet, just the hexagons themselves for now. But, I've included the whole and the half hexie and I've included instructions written out with the US terms too. A first for me! As is my annoying way, I've added other colours into my stylecraft mix. Partly because I had those yarns in stash and wanted to use them up and partly because, big as the stylecraft colour range is, there are always some colours that aren't quite what you want. Especially greens, I think they need better greens! So those are the colours that I've gone for this time. As I mentioned when I talked about the Painted Roses blanket, the sherbert is a lot brighter than the Jarol Heritage colour. Stylecraft don't really have a duck egg colour, but this is their closest. The stylecraft colour is quite muddy in comparison to 'Zing' that I'm using. Slightly more so than in this photo, as the zing really pops beautifully in real life. But I do like that the Lime balances out the Sherbert, so that works quite well. This is the one I struggle with most. For me, the Meadow doesn't show enough contrast against the Lime in the stylecraft colours. Whereas the two greens I've chosen are clearly very different. It is the closest Stylecraft match but you may want to check out their other greens to find a shade you are happy with. This is a tricky one too. Again, there's nothing quite like the pink I'm using available in the Stylecraft colours. I think Clematis is the closest shade match, although it's a bit darker. But I think, if it was me and I was going with the Sherbert and Lime, I'd probably plump for the Fondant pink instead. I thought it'd be useful to show both though, so you can make you own minds up! I really hope that helps you get started on your own Weekend Blanket, if you fancy making one. I'll be back on Friday to give you all the information you need on the 'alonging' so we can get started on cheering each other along and start making some fantastic blanket progress, on blankets old and new! Not that you need to wait till then to get started of course. Thank you, the hexagons are lovely. It's really nice to have charts. If I am honest I love to have both a chart and written instructions. Sometimes a chart alone can be missing a little bit of help. On the other hand it can helpfully clarify any written instructions and act as shorthand at times too. I really like the way you have hand drawn the charts. I am all for hand-made being hand -made and not feeling the pressure to reproduce in the same way big companies do. It doesn't make the skill involved any less and I like the personal touch which makes it more special and it looks charming too. Glad you are enjoying your new pens. I have some either the same or a different make. I have begun drawing again and they are part of my supplies. I may well join in the crochet a long as I have a started blanket on the go, and I have definitely found it hard to keep it going. I also just got those pens! Great, aren't they? OMG, so many hexies I think I could die!! Ooh really? How exciting! I shall definitely look out for that post then. I read all your posts anyway of course, but that will be one to look forward to :) Did you get to have any influence in the colours, it would be fab if you did, I know you’d be able to lead them in the right direction! Thank you so much for this BAL! I am excited even though I have another blanket to finish first I will be making yours on the weekends. Also, thank you for your attention to details in your patterns and even to colors and yarns you chose. Thank you also for page numbers! I can't tell you how many times I have gotten confused on patterns I have printed out and had to go back and number them all so I wouldn't get confused! LOL! I don't know how to read charts (I would like to learn and maybe I can with the written AND the chart. Also, I need some yarns although I do have some Stylecraft and some nice person on the Group on Ravelry said there is a sale at Deramores and FREE SHIPPING even to the U.S. What a great week this is! 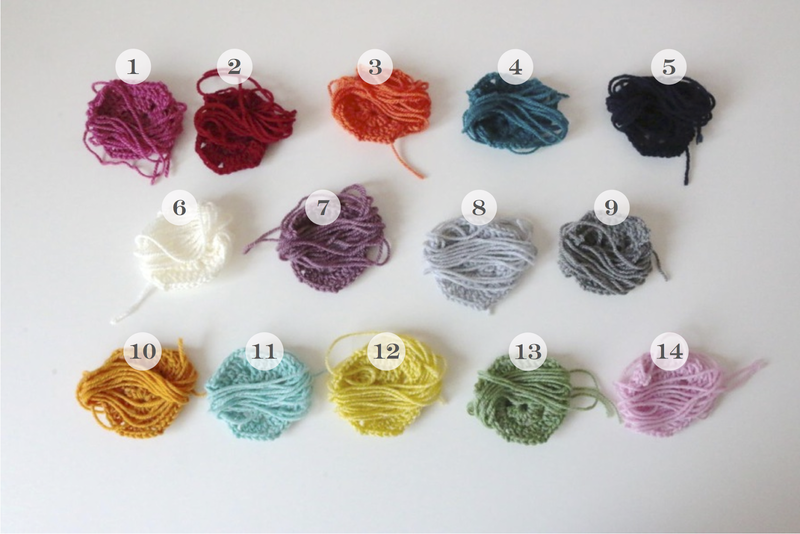 Tomorrow I will sit down and plan out my colors and order my yarns. So fun! Thanks again for all of it! P.S. I also printed out your JAYG method as I need to learn that too. You're wonderful! I totally love this WIP. Fantastic post. I love your discussion on colours, very helpful indeed. Thanks so much for the hexie patterns too, there is just something about hexies that always gets me wanting to get my crochet hook out! How are you joining the hexies together? Very nice instructions, and love the blanket. I am saving this for future reference. What a lovely idea! Especially for a group project. Thank you for sharing. That blanket going to be amazing! Great colour combination! Aprecio muito o seu blog, super colorido, com idéias fantásticas e ótimo astral. Parabéns pelo ótimo trabalho e obrigada por compartilhar! Um abraço from Brazil. 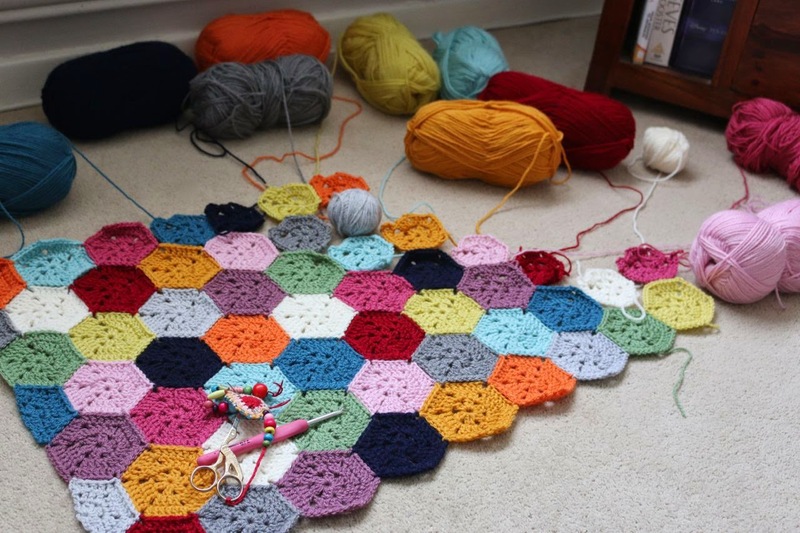 Oh, I do love a hexie blanket! I really must get mine out from the depths of a bag before the weekend... And I have now happily sat and watched your second pod cast - lovely to watch with a coffee! I so agree with the Stylecraft greens. They don'y have enough pretty soft but warm greens or sage greens. Theirs are either drab or too deep. 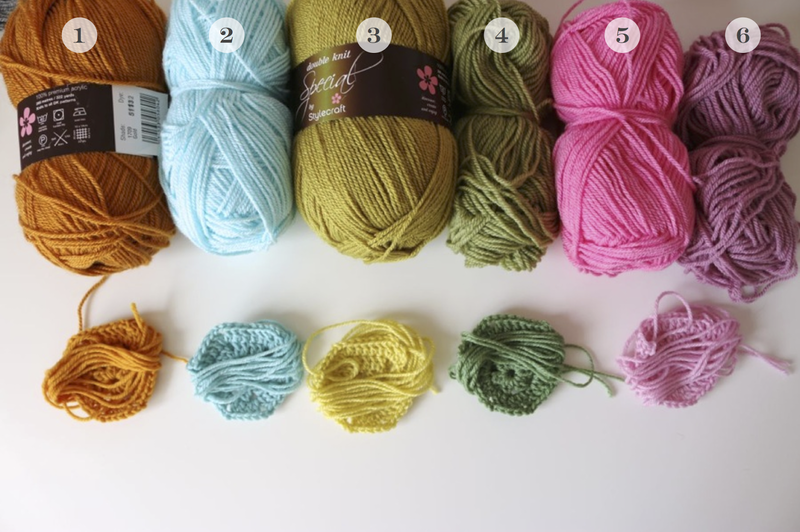 Did you see on Attic24 that Stylecraft are holding a competition to seek out new colours? I would ask for a mid soft duck egg kind of colour but you need to send a photo and I haven't anything that shows the colour I have in mind.